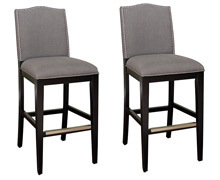 We offer over 1000+ bar stools for you to choose from and each comes with Free Shipping! 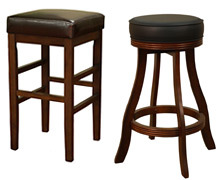 Browse our excellent selection below and don't miss out on our bar stools sale. We have extraordinary designs to choose from to go with your game room bar or your kitchen counter top. With our vast selection of styles of barstools, you can be certain to find ones that go perfectly with your decor and design project. 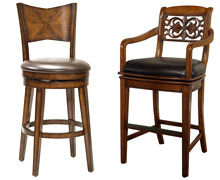 Finding the right bar stool for your home can be a tricky business. You're looking for a comfortable seating spot that is stylish and sturdy. Swivel bar stools can be a great option because they're easy to get seated in without having to move the stool away from the counter, a simple sit and twist does the job. This option also comes in handy when you have a gathering of guests. It allows the person seated in the bar stool the ability to turn and face various parts of the room without having to get up and move. This makes it much easier for conversation. You can find this option in counter height stools, kitchen bar stools, adjustable and upholstered bar stools, and other bar chairs seating. 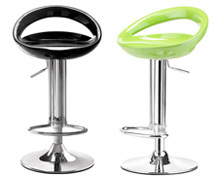 There are quite a number of options when choosing the type of materials for your barstools. 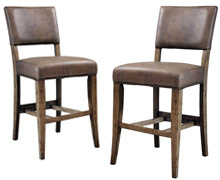 Popular choices include wood bar stool, metal stools, leather barstools, and other upholstery fabrics stools. Because outdoor furniture is exposed to the sun and the elements, special consideration is given to material composition in this classification of bar stools. Materials suitable for outdoor use include stools made of: aluminum, acrylic, synthetic wicker and rattan. Each of these material choices bring their own individual benefits, depending on what you're looking for. Wood offers a classic warm look for your room. 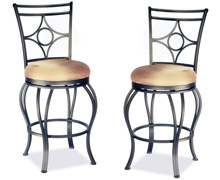 Metal bar stools are lighter to move around and typically come with intricate patterns and designs. And of course, there's the timeless luxury look of leather which is always in style. If you like the commercial industrial look, be sure to check out our aluminum crafted bar stools, like our Sailor aluminum bar stool. If a contemporary look is what you're after, our colorful acrylic bar stools might be just the thing to finish off your kitchen or bar. Whatever your material choice, DCGStores.com is certain to have something that will fit your needs. 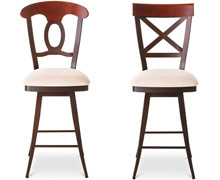 From high end to cheap bar stools, we have one of the best selection and prices online. 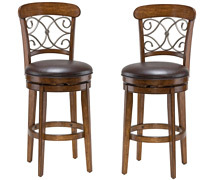 Be sure to visit us often so you won't miss our latest bar stools sale. 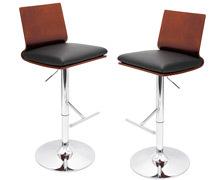 How tall should the stools be? Do you want them to have a back or not? Should they swivel or have an adjustable height feature? These things are particularly important if the bar stools will be in an area that will see heavy use, a kitchen island for example. Certainly, if you have a piece of furniture that will be utilized almost daily it should offer you the optimum amount of comfort as well as mesh well with your design and general room decorating scheme. Measure the height of your counter to be certain that your bar stools will be the correct height to match. Dinettes and kitchen counters usually require counter stools which are 24" to 26" high to give proper leg room. 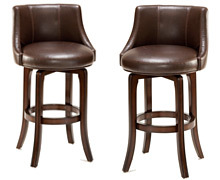 For bar furniture, look for barstools measuring 28" to 31" high. 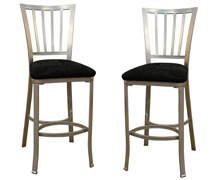 If you need something taller, we have a special category just for you in our Extra Tall bar stools section. If you have any questions regarding our products, please contact our friendly staff at 877-760-8856 today!